​For 2018, we offer four grape wines (two reds and two whites) and three non-grape wines. ​​Mighty Bison is our dry red Marquette wine. It has an attractive ruby color, pronounced tannins, and desirable notes of cherry, berry, black pepper, and spice on both nose and palate. 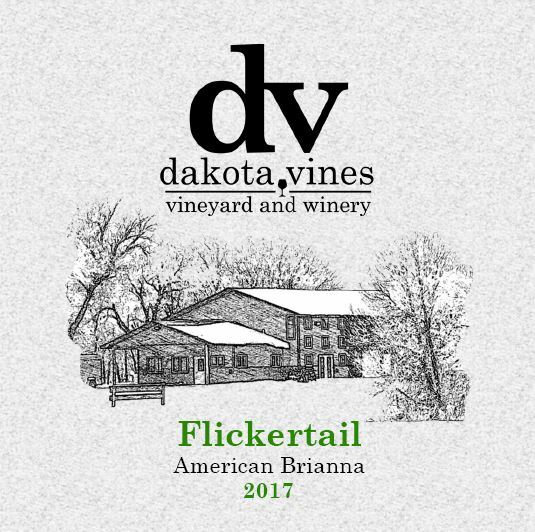 Flickertail, our sweet Brianna white wine, has tropical fruit aromas and slight floral characteristics with honey, apricot, and peach flavors. ​​Roughrider, our Frontenac wine, is a semi-dry red wine with a deep garnet color that complements its distinctive cherry aroma and inviting palate of blackberry, black currant, and plum. Prairie Sky, our semi-sweet La Crescent white wine, has a light straw color, with a bouquet of melons and citrus, followed by flavors of tropical fruits. Lake Agassiz is our semi-sweet apple wine that presents aromatics of fresh apples that shows crisp acidity and tart flavors, reminiscent of biting into a fresh apple. County Road is our sweet pear wine that has fresh, ripe pear aromas and flavors with subtle astringency that is surprisingly refreshing. Peace Garden is our semi-sweet plum wine that is subtly sweet with rich plum flavor and aromatics with just a hint of tartness.